-The pig was the last to arrive at an important meeting because he slept in. -A wolf destroyed the pig’s house so he had to rebuild it before he could get to the meeting. -The pig stopped to enjoy a feast while taking part in a race. He resumed the race but not surprisingly came in last. -Being pretty pudgy, the pig moved the slowest in the race. Although pigs often get associated with being smelly and dirty, they keep quite clean if they are in a temperature controlled environment. They only roll around in dirt when they get hot, and this is because they cannot sweat. As far as smarts go, pigs are considered to be one of the most intelligent animals in the world. As pets they can figure out how to open a cupboard, and can be trained to shake a hoof and roll over. 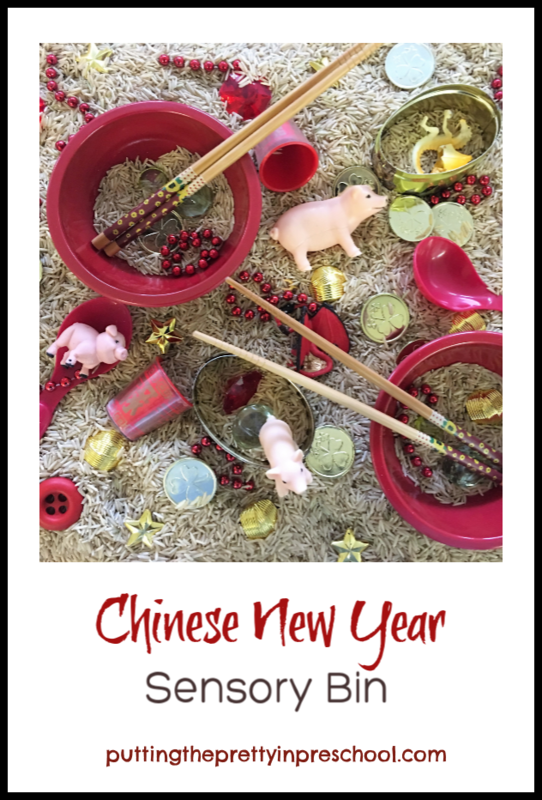 The Year of the Pig might just be a positive one for everyone! People born in the Pig Year are attributed with an agreeable personality, balanced lifestyle, hardworking nature and enjoyment of life. These qualities are thought to have a positive influence on all people. In recognition of Chinese New Year, this weekend there will be celebrations all over the city of Edmonton. Events will include lion and dragon dances, music, dancing, and cultural performances. There will be karaoke singing for seniors and crafts for children. West Edmonton Mall will host a talent show as part of their itinerary. The University of Alberta will hold a Lunar New Year Gala, so Asian students can celebrate the holiday and make new friendships while staying in Edmonton to further their studies. 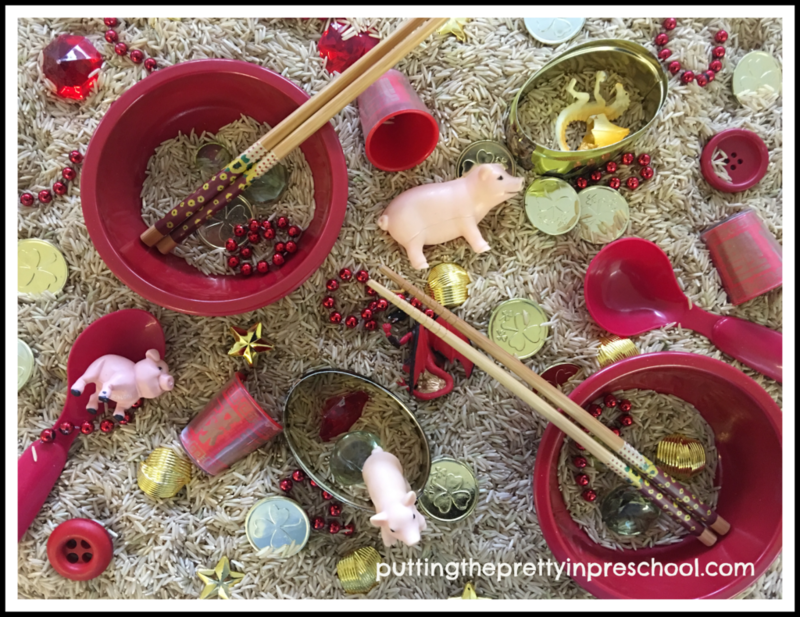 Here’s a sensory bin to celebrate Chinese New Year 2019. The rice is a neutral color, but colored yellow rice would work well too. For other sensory play ideas, check the Sensory Play page on this blog.